Slit-lamp picture of an eye with advanced keratoconus showing gross inferior bowing (ectasia ) of the cornea with associated thinning (courtesy of Addition Technology Inc). It is relatively common, affecting approximately one in one thousand people. It occurs in all ethnic groups world wide with males and females affected equally. It is typically bilateral, but asymmetric with the worse eye continuing to have a poorer prognosis as the condition progresses. Unilateral cases are very rare and it is not uncommon for keratoconus to be diagnosed first in one eye and then later in the other. The occurrence of keratoconus is usually an isolated condition, but has been reported to occur with increased frequency in a number of eye and bodily disorders. Eye associations include allergic eye disease, retinitis pigmentosa and aniridia. Bodily associations include atopy (eczema, hay fever), magnesium deficiency, Down's syndrome, Turner syndrome and connective tissue disorders, such as Marfans, Ehlers-Danlos, osteogenesis imperfecta and pseuodoxanthoma elasticum. It has been particularly linked to various forms of eye trauma such as hard contact lens wear, allergic eye disease and eye rubbing. An inverse relationship between the severity of the condition and diabetes has been reported. A genetic predisposition to keratoconus has been observed with the disease reported with increased incidence in some families. The frequency of occurrence in first and second degree family members of affected individuals is variable although it is known to be considerably higher than that in the general population, and studies have estimated between 6% and 19% of close family members may be affected. Genetic linkage studies have demonstrated multiple loci on different chromosomes, suggesting a number of genes may contribute to keratoconus susceptibility and whilst most genetic studies agree on a dominant autosomal model of inheritance (50% of off-spring affected) other models of inheritance have been suggested and variable penetrance (variable severity in different affected family members) is well documented. Individuals with keratoconus typically present to their Optician with blurred vision, usually in one eye, which may be of a fairly rapid onset. Photophobia (difficulty looking at light) and reports of eye-strain are not uncommon. Symptoms of multiple ghost images and flaring around light sources are common. There is often a history of worsening and variable short-sightedness and astigmatism (irregular curvature of the cornea), although the very early stages can be difficult to detect with only one eye being affected initially. More established cases have prescription changes at increasingly frequent intervals with the refractive error being difficult to correct with spectacles or soft contact lenses and the need for rigid (hard) contact lens correction. Slit-lamp examination (a microscope device used to examine the eye) shows very fine, vertical, faint stress lines in the cornea (Vogt lines), Fleischer's ring (which is a yellow-brown ring of iron pigment seen at the base of the cone beneath the epithelium in approximately 50 per cent of patients) and visible corneal nerves. Corneal topography is the most sensitive method for detecting very early keratoconus by identifying subtle, inferior corneal steepening. Corneal topography is a method by which a computer is used to analyse a video picture of the reflection of a series of rings of light, projected onto the surface of the eye, to make a detailed map of the surface of the cornea based on the position of the rings. In advanced cases, spontaneous ruptures of the inner surface of the cornea (Descemet's membrane and the endothelium) can occur, causing a crescent-shaped tear near the apex of the cone. The rupture allows aqueous (the watery fluid inside the front part of the eye) to pass into the cornea resulting in significant corneal oedema (fluid swelling) and opacification. The patient will report a sudden loss of vision, discomfort and a visible white spot on the cornea. Although the break usually heals within 6-10 weeks, and the corneal oedema clears, a variable amount of corneal scarring may develop. Corneas that do not recover transparency may require a corneal transplant. Occasionally acute hydrops, and the subsequent scarring it causes, can benefit patients with extremely steep corneas as the scar can flatten the cornea making it easier to fit contact lenses. Individuals with keratoconus typically present with mild astigmatism in adolescence, initially correctable with spectacles and soft contact lenses, and are usually diagnosed a few years after initial presentation as the best spectacle corrected acuity falls and/or clinical signs progress. In rare cases keratoconus presents in childhood or later in adulthood. Early age of onset appears to indicate a greater risk of disease severity later in life. The course of the disorder can be quite variable, with some individuals remaining stable for years or indefinitely, while others progress rapidly or experience occasional exacerbations over a long and otherwise steady course. Most commonly, keratoconus progresses for a period of ten to twenty years before the course of the disease stabilises in middle age. The treatment of patients with keratoconus depends of the degree of ectasia (corneal bulging) and the resultant irregular astigmatism. Early and mild cases can be treated effectively with astigmatic spectacle correction and soft toric (astigmatism correcting) contact lenses. As the disease progresses rigid (hard) contact lenses become the mainstay of treatment. In the majority of eyes such lenses provide good visual rehabilitation. Unfortunately they are not the solution in all cases. 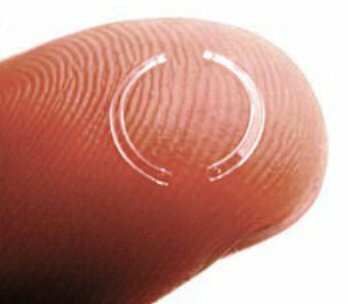 Discomfort and patient preference may limit the use of rigid contact lens wear and in advanced cases fitting may be problematic. Severe ectasia and central corneal scarring in advanced keratoconus can significantly limit the amount of visual rehabilitation achieved by rigid lenses. In addition, there is a body of evidence to suggest that repeated trauma caused by the wearing of rigid lenses may in some cases be responsible for the acceleration of the condition. Between 10-25% of cases of keratoconus progress to the point where the correction of vision with rigid contact lenses is no longer possible, especially in those who present at a young age (less than 20) and with very steep corneal curvature (keratometry) measurements (>55 diopters). In the past, such patients have had only one realistic surgical option - a full thickness corneal transplant or penetrating keratoplasty. Keratoconus is one of the most common indications for penetrating keratoplasty, accounting for around 15-25% of such surgeries. The procedure is generally performed under general anaesthesia. It necessitates an experienced corneal surgeon trephining a full thickness circular piece of tissue from a donor cornea which is then sewn on to the host, with either running or individual tiny nylon stitches, once the central diseased corneal tissue of a similar size has been trephined and removed. As the cornea has no blood vessels, the donor and host do not have to be tissue matched and eye banks, after checking for communicable diseases and tissue quality, can provide suitable tissue within a few days or weeks. Following surgery, visual recovery typically takes several weeks/months, with full stabilisation often taking up to a year, after which time the stitches can be removed. 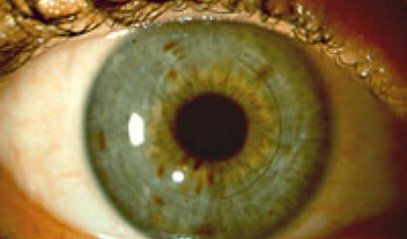 Corneal transplantation in keratoconus is considered relatively low risk, in terms of graft rejection and other post-operative complications, as these eyes do not typically exhibit corneal blood vessel ingrowth and other eye diseases. 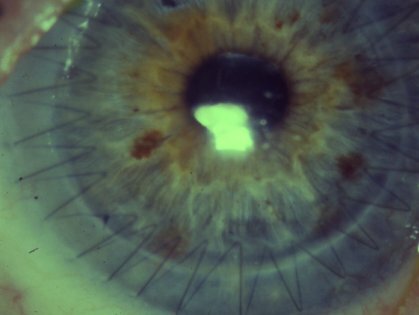 As such, the outcomes of penetrating keratoplasty for keratoconus are very favourable with excellent long-term graft (transplant) survival rates, acceptable post-operative best-spectacle corrected visual performance and good long-term stability, with a recent follow-up study reporting 97% five-year survival and 92% ten year survival in primary grafts. Graft rejection episodes do occur but invariably respond to medical management with few cases resulting in graft failure. Induced astigmatism can limit visual rehabilitation in up to 30% of patients, many of whom require further refractive surgical procedures such as astigmatic keratotomies (peripheral partial thickness corneal cuts), or, in more recent years, Excimer laser procedures. Continued endothelial cell loss has been reported. Endothelial cells lie on the inner surface of the cornea and are important in maintaining the cornea in a dehydrated state and therefore transparent, once lost they cannot re-grow and if too many die, the cornea becomes waterlogged and opaque. Recurrence of keratoconus in the transplanted cornea has been reported and late progression of astigmatism with a reported mean time to recurrence of about 18 years. Although outcomes after penetrating keratoplasty in keratoconic eyes are favourable with good visual rehabilitation and long-term stability, graft rejection, failure and induction of significant astigmatism are not infrequent occurrences. In keratoconus the corneal endothelium (vital innermost layer of cell maintaining corneal transparency) is generally intact and healthy, even after cases of acute hydrops. Whilst corneal stromal rejection episodes can occur (the stroma is the main tissue/substance of the cornea, lying between the epithelium and the endothelium), it is known that with time host corneal cells (also called keratocytes) migrate into the stroma and replace the donor cells. Most rejection episodes (especially after 18 months) are invariably endothelial in origin (these cells are never replaced and are always of donor origin after corneal transplantation). It is for these reasons that there has been a trend over recent years to perform lamellar (partial thickness), rather than full thickness, penetrating techniques. Such procedures offer replacement of the diseased (stromal) part of the keratoconic cornea whilst leaving the healthy non-diseased endothelial cells relatively intact. This negates the risk of endothelial rejection and theoretically improves the post-operative mechanical stability of the cornea with less chance of wound dehiscence. Deep Anterior Lamellar Keratoplasty is Professor O'Brart's preferred corneal transplantation technique for keratoconus. It has been shown to result in less endothelial cell loss, less intraocular pressure problems, a reduction in rejection episodes and, in some cases, a reduction of induced astigmatism than full thickness procedures. However, whilst some published studies have achieved comparable visual outcomes, others have demonstrated that in terms of best spectacle corrected visual acuities of 20/20 or better, penetrating techniques slightly outperform lamellar procedures and that whilst endothelial rejection is negated, stromal rejection very rarely can occur. Further refinements in operative techniques, together with improvements in technologies, such as the implementation of sophisticated lasers (femtosecond lasers) and mechanical devices (microkeratomes) for cutting the corneal tissue in lamellar keratoplasty, will allow for further refinement of lamellar techniques and improve the ease of performing these procedures for both surgeons and patients alike. This procedure involves removing the corneal epithelium from the donor and then sewing, onto the underlying corneal stromal bed, a previously lathed lenticule of donor cornea. The procedure has generally resulted in less favourable outcomes than penetrating keratoplasty and, whilst implementation of more advanced technologies has helped improve outcomes, it has been largely replaced by deep anterior lamellar techniques. A recent surgical alternative to corneal transplantation to correct irregular astigmatism in keratoconus has been the insertion of intracorneal ring segments. The technology has been available for over fifteen years for the correction of low degrees of myopia (up to -3.0 diopters). More recently these ring segments have been used to reduce the irregularity of the cornea and flatten the apex of the cone in mild to moderate cases of keratoconus with some success. Two types of intrastromal rings are available: Intacs which have a hexagonal cross section and are placed more peripheral than Ferrara Rings that are triangular/prismatic in shape. Intacs were approved by the FDA in 1994 for low myopic corrections and extended to treatment of keratoconus in July 2004. The rings can be inserted into the mid/deep corneal substance (stroma) as a quick and painless out-patient technique, with drops being used to anaesthetise the eye, either using a specially designed vacuum lamellar dissector to create the circular pockets for the rings or, more recently, with femtosecond laser technology. The precise mode of action of the rings is unknown but it is assumed that the ring segments push out against the curvature of the cornea flattening the peak of the cone and returning the cornea to a more natural shape. Studies have in the past also suggested an important role for the overlying epithelium, with thickening adjacent to the segments having an important smoothing effect. Results have generally been favourable with most, but not all, eyes achieving a significant reduction in astigmatism post-operatively, accompanied by an improvement in best spectacle corrected and uncorrected visual acuity. Whilst most published case series remain small, favourable outcomes of up to 24-36 month follow-up have been achieved. The results seem to be best in eyes with mild to moderate keratoconus. Perforation of the anterior chamber is a small risk during the procedure and lack of efficacy, infection, sterile keratitis and late ring extrusion account for a number of failures. Removal of problematic ring segments can easily be performed and has been shown to allow the cornea to return to its pre-operative state. 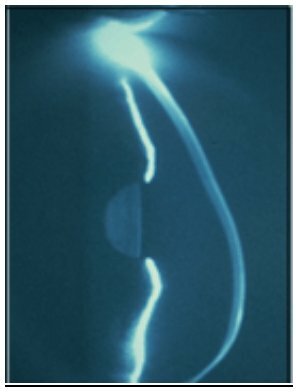 Studies have demonstrated that about 10% of rings need to be removed, either because of the complications discussed above or due to lack of efficacy. It is still possible to perform both lamellar and penetrating keratoplasty techniques following ring removal. There is some debate amongst the ophthalmic community as to whether one or two Intac segments should be inserted. Certainly most practitioners would agree that a thicker segment should be inserted inferiorly around the base of the cone. A number of practitioners advocate insertion of only a single segment inferiorly with studies suggesting the results are comparable. Refinement in ring technology (in terms of diameter, shape, thickness and width), a greater understanding of corneal biomechanics and further development of treatment algorithms should, in the future, allow more predictable refractive outcomes together with the increased use of intracorneal ring technology for the treatment of mild to moderate keratoconus. Professor O'Brart has been using ring segments for over 15 years and it is his experience ring segments may be useful in the contact lens intolerant, mild to moderate, keratoconic eye (central keratometric measurements of less than 53 diopters) with no central corneal scarring and that this should be attempted before considering corneal transplantation. His results have been encouraging and have demonstrated an average 2 diopter reduction in both astigmatism and corneal steepness with an accompanying two-line improvement in both the corrected and uncorrected vision. Such changes have allowed many patients to return to, and see with, the use of contact lenses (soft and hard) and even spectacles thereby avoiding the need for corneal transplantation. It must be stressed, however, that at present intracorneal ring technology does not offer a cure for the condition and there is also no evidence that it halts the progression of the condition. Riboflavin (Vitamin B2)/Ultraviolet-A (370nm) corneal collagen cross-linkage is the first therapeutic modality available to actually stabilize the keratoconic process. The aims of the treatment are to increase the mechanical stability of the cornea and its resistance to enzymatic digestion, by inducing cross-linkage between the corneal collagen and other protein fibres. Photochemical collagen cross-linking by Riboflavin/UVA is a simple, safe and technically easy to perform outpatient surgical procedure. Professor O'Brart is one of the leading clinical researchers in this field and has published over 30 peer-reviewed publications in this field. The technique is performed under topical anaesthesia (eye drops). During the standard procedure the Riboflavin eye drops are applied to the corneal surface every three to five minutes. Once adequate Riboflavin corneal absorption has been achieved (this usually takes 30 minutes), Ultraviolet A light is then shone at the eye. At the UV energies used, the technique has been shown to be safe, provided the cornea is thicker than 400μm, with no loss of corneal transparency and no damage to deeper ocular structures. In laboratory studies Riboflavin/UVA cross-linkage has been shown to improve stress-strain measurements, reduce the swelling rate, increase shrinkage temperature and increase the resistance against enzymatic degeneration of corneal stromal tissue. Clinical studies have demonstrated stabilisation of keratoconic eyes with no evidence of progression with up to 10 years follow-up and some slight regression of the ectasia (bulging of the cornea) by an average of 2 diopters. No long term problems in terms of loss of transparency of the cornea or lens have occurred after cross-linkage surgery. Professor O'Brart undertook and published the first prospective, randomised clinical trial of Riboflavin/UVA corneal collagen cross-linkage. The results were very encouraging with stabilisation of keratoconus in all treated eyes. He has published a series of patients with 4-6 and 7-8 year follow-up showing excellent stability over this period with continued improvement in corneal shape and reduction of keratoconus in most eyes. This technique appears to offer great promise and is the first treatment to stabilise the keratoconic process, allowing treatment of the cause, not just the symptoms and end result of the condition. The ability to halt disease progression at the earliest stages of the condition, when full visual rehabilitation can still be achieved with spectacles and soft contact lenses, offers great hope for future generations suffering with this not infrequent and often visually devastating condition. As Riboflavin does not easily penetrate the corneal skin or epithelium, this skin has to be removed prior to the procedure using a blunt spatula. Professor O'Brart has designed and conducted a number of published scientific studies indicating the need to remove the epithelium to allow riboflavin to enter the cornea. However, whilst simple to perform, epithelial removal is associated with significant post-operative pain and delayed healing, with visual recovery taking 2-3 weeks. Recent formulations of Riboflavin eye-drops and new delivery systems, such as Iontophoresis (using a very mild electrical current), may allow the procedure to be successfully performed without the need for complete epithelial removal only superficial scratches. This results in much less discomfort after surgery and the eye heals with vision returning within a few days/weeks. Professor O'Brart has been, and is directly involved in, both laboratory and clinical studies evaluating these new formulations and is currently conducting a comparative clinical study with a modified Iontophoretsis technique which is showing comparable results between this technique and epithelium off surgery at 18 months. Corneal surgery in keratoconic eyes can be problematic, require specialised equipment and be technically difficult to perform. It may also be associated with further destabilisation of the cornea and worsening of the ectatic (bulging) process, as in the case of laser refractive and incisional surgery. Whilst not addressing the correction of irregular astigmatism, refractive lens exchange and toric phakic intraocular lens (akin to intraocular contact lenses) insertion may be of some benefit in selected patients with early/mild keratoconus and functional best spectacle corrected visions. Clinical studies have demonstrated significant improvements in unaided visual performance with good safety both for refractive lens exchange and toric phakic intraocular lens insertion. Such treatment modalities are relatively easy to perform and may offer an alternative in selected contact lens intolerant keratoconic patients for treating astigmatism and myopia, before considering keratoplasty techniques. Further refinements in positioning and implantation of toric intraocular lenses and pre-operative lens selection (biometry) techniques in these problematic eyes may allow the greater use of lenticular (lens) refractive techniques for the future management of some keratoconic eyes. The advent of Excimer laser refractive surgery has heralded a new era in Ophthalmology. Such techniques have been shown to be safe and effective for the correction of low to moderate degrees of myopia (short-sight), hyperopia (long-sight) and astigmatism (unequal curvature of the cornea and lens) and millions of procedures have been performed worldwide. However, one of the major contraindications to such surgeries is the presence of overt or even sub-clinical/hidden keratoconus. An association between development/acceleration of corneal ectasia in such eyes and Laser in situ Keratomileusis (LASIK) has been clearly established with keratoconus being an absolute contraindication to LASIK surgery. Whilst a number of investigators have proposed Excimer laser Phototherapeutic Keratectomy (PTK) and Photorefractive Keratectomy (PRK) as possible actual treatment modalities for keratoconus, recent reports of corneal ectasia following PRK suggest that such procedures are not advisable in these eyes and that keratoconus, in all its forms, should be regarded as a relative, if not an absolute, contraindication. Similarly, some surgeons have advocated the use of radial keratotomy techniques (deep radial cuts) for the correction of selective patients with mild to moderate keratoconus. Such techniques, which are known to mechanically destabilise the cornea, are probably not advisable and must have the potential to exacerbate the ectatic process in the medium to long term. Indeed, ectasia has been reported after radial keratotomy. Whilst many surgical interventions for keratoconus are still at a developmental stage, the use of techniques which are additive (such as Intacs), that mechanically and chemically stabilise the cornea (Riboflavin/UVA corneal collagen cross-linkage) or that replace the diseased corneal tissue (keratoplasty/transplantation techniques) must be deemed preferable to procedures that remove tissue (Excimer laser) and mechanically destabilise the cornea (astigmatic and radial keratotomies), particularly in a condition where the cornea is known to be thin, ectatic (bulging) and mechanically unstable.